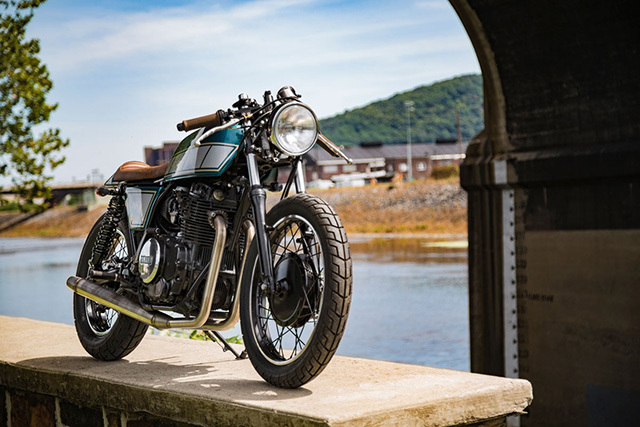 Yamaha XS400 – Real Moto Co. If you’re putting together a basic rock band it’s not too hard to work out the pieces to the puzzle; at a minimum you need a singer with a sick set of pipes, an axe man to rock out and someone to swing the sticks on the skins. 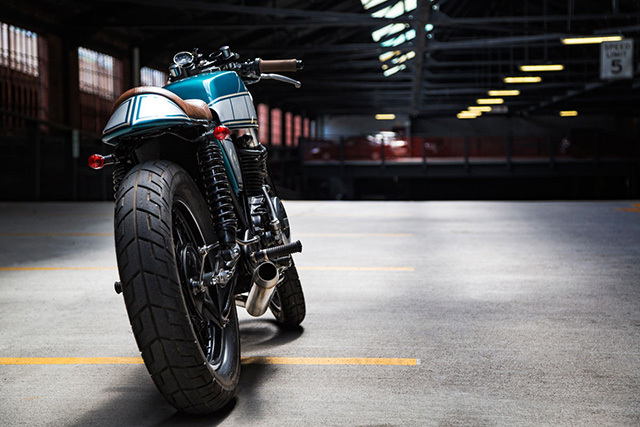 So if you’re following the same minimalist formula what do you need to form a small custom workshop to create brilliant builds and still have the talent on deck to make some incredible merchandise and branding to get the company exposure? From the USA’s east coast, Real Moto Co. have found the perfect formula in two guys who can spin the spanners and bring very specifics skills to the floor. 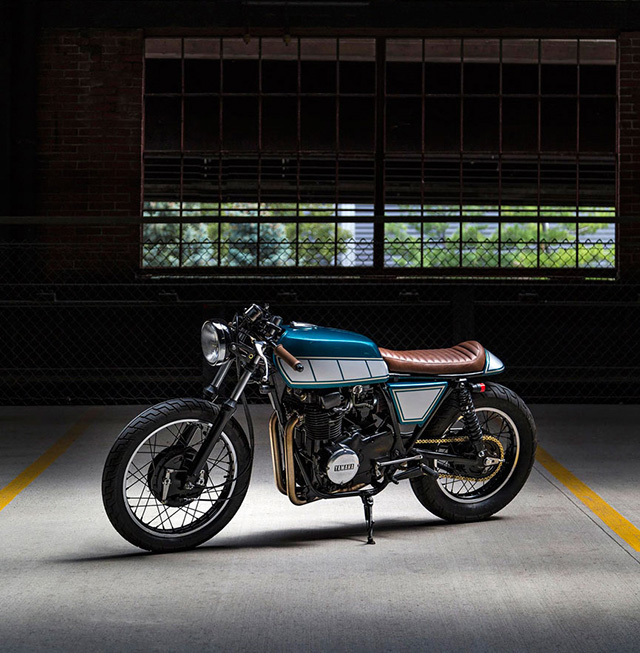 Dan Stabbings is the metal man and his partner in crime Jacob Speis a brilliant graphic designer, together they’ve produced the companies debut build – a stunning 1981 Yamaha XS400 that is the perfect opening track. “We’ve been friends for many years, but a few garage beers while welding up a tail hoop for Jacob’s personal project got us talking about how inspired we both had become by the recent wave of motorcycle customs and wondering how we could get more involved in a way that made the best of both of our skill sets.” Dan is fabricator with more than a decades experience with structural steel work, while Jacob is a lead graphic designer from Relapse Records in Philadelphia and together they share a love for VW’s that has influenced their automotive and mechanical backgrounds. 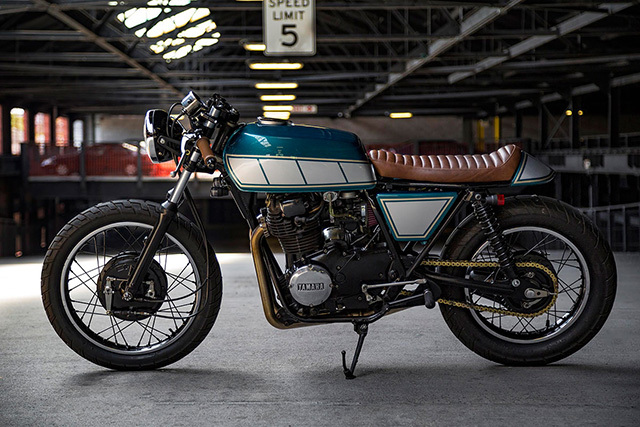 But for their first build they needed to find a bike to play with and it came in the “form of an ’81 XS400. It was pretty clapped out and probably lived a rough life, but it had potential.” Originally the plan was to do a basic fix up, add some bolt on mods and flip it for a profit and then look to start again. But as they always do when you start modifying a motorcycle, things got out of hand quickly and resulted in a full on rebuild. With the engine out and the bike back to the bare frame Dan was able to put his metal work skills straight to work and began cleaning up the 35 year old steel. He removed the most rearward section of the factory subframe and then formed his own rear tail hoop to be welded in. But he also went the extra mile, which is seen throughout the build, by fabricating a pair of slugs that add both strength and rigidity to the new tail for a quality finish. Covering the new tail is a cowl that was hammered and hand rolled by Dan in a design of his own choice and the quality is there for all to see. A spur of the moment decision to blend the new cowl with the frame works a treat, the finished piece merges perfectly with the chassis for an ultra-clean line and gapless appearance that once you notice you start to realise it’s how they all should be done. 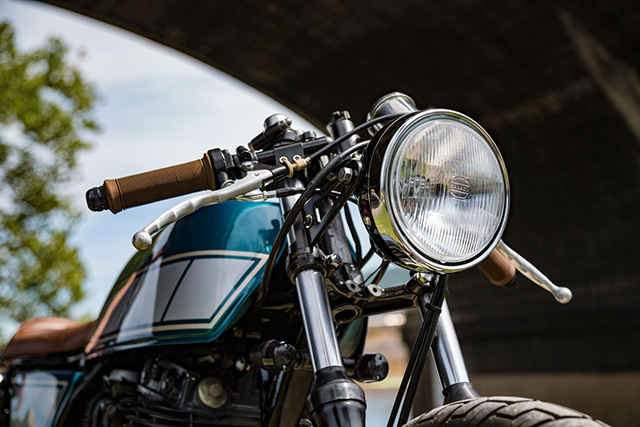 With a fresh engine and beautiful bodywork attention could be turned to do a lot of the little things that help set a bike apart and make it better to ride. Knowing they’d be running clip-on bars it made perfect sense to get the rider more tucked in with a re-positioning of the footpegs. Dan fabricated all new linkages for the shifter and rear brake and then relocated the footpegs to the passenger position by welding on adaptor plates and smoothly blending them into the frame. The end result is excellent but it posed a bit of an issue. “I realised the kick starter now collided with the rear brake control, so I sectioned out about 3 inches for clearance. 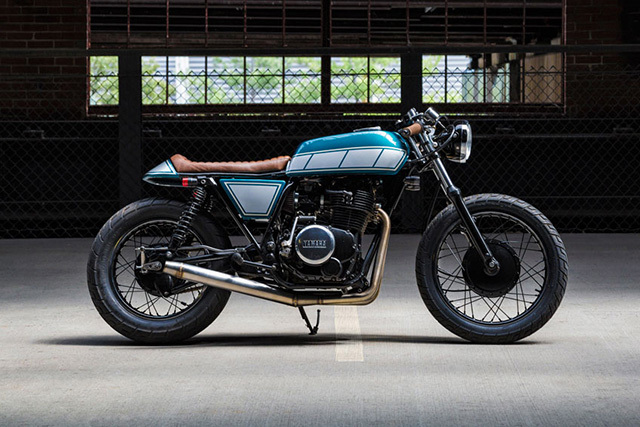 Thankfully, the bike still starts on the first kick every time.” With that taken care of Jacob’s design called for keeping the front end clean and classic and they’ve more than pulled it off with the new clip-ons wearing a tasty set of brown grips and classic hand controls. 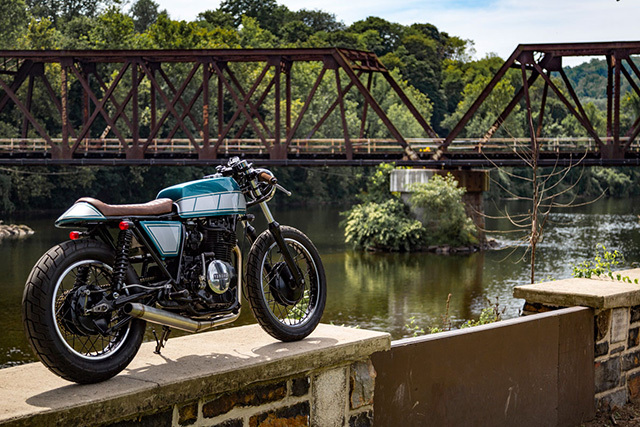 The drum brake front end does more to capture the classic appeal of the era on a bike that has simply never looked so good and a sensible tire choice makes for the best of both on road performance and vintage styling. 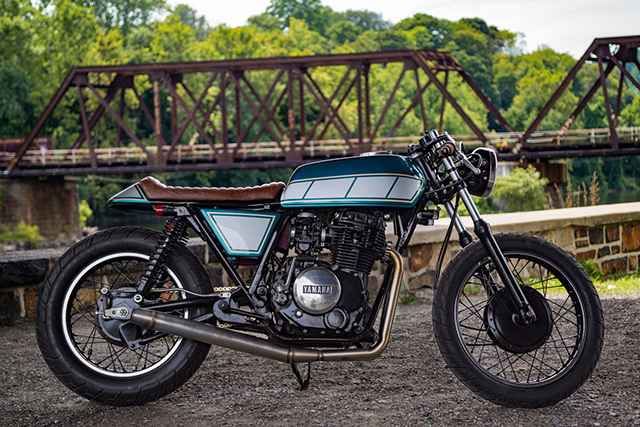 It might be their first build as Real Moto Co. but the quality of workmanship and attention to detail have shown Dan and Jacob are here to stay and if they can make an ’80s XS400 look this good, just imagine what’s to come.